I'm checking out walking in the Washington, D.C. area this week, so until I have time to report on what life on foot looks like on the East Coast today, here's some info on what life on foot was like at the turn of the last century--and how it led to some of the first pedestrian advocacy groups. The first organized groups to promote pedestrian safety formed in response to the increasing prevalence of automobiles on city streets. Some of the groups, like the Long Island Highway Protective Society established in 1902, were independent associations. However many, such as the Society for Political Study’s Committee for the Prevention of Reckless Driving and Street Accidents and the Safety First Federation of America’s Street Traffic Committee, were part of larger civic organizations. Often at odds with increasingly powerful motorist lobbies, these groups pushed for greater regulation of drivers and motor vehicles, including the adoption of speed limits, the installation of traffic signals, stricter enforcement of roadway rules, licensing requirements, and competence exams for drivers. 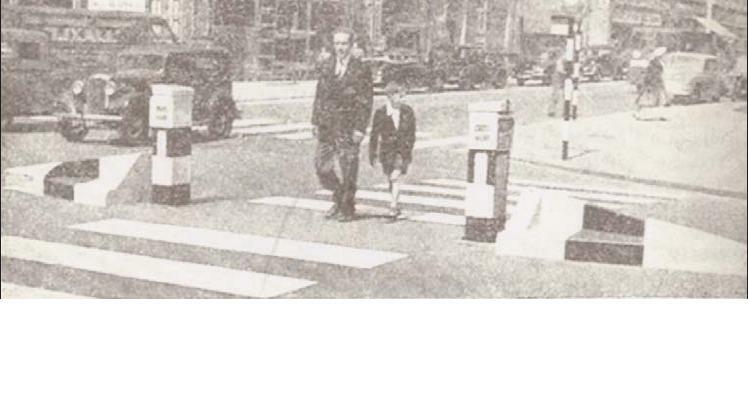 They also argued for the creation of uniform traffic laws, including laws to protect pedestrians at crossings. Safety organizations paid particular attention to educating children, who were accustomed to using city streets as their playgrounds, about roadway safety. 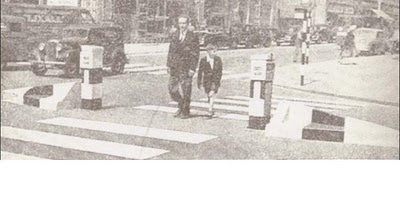 One of the most prominent of the early pedestrian safety organizations in the UK was the Pedestrians Association, which continues to operate today under the name Living Streets. Founded by Viscount Cecil of Chelwood and reporter Tom Foley, the Pedestrians Association was formed for “the defence [sic] of public rights, especially of pedestrians.” During its early years the Pedestrians Association lobbied strongly for legislation to protect pedestrian safety and promote walkability, including the adoption of speed limits, requirements for speedometers in vehicles, the installation of sidewalks, and the closure of certain roadways after school hours to create “play streets” for children (and you thought woonerfs were a Dutch idea). The Pedestrians Association continued to operate throughout World War II, pushing the government to allow pedestrians to carry flashlights at night for safety, even during blackouts. After the war automobile ownership in Great Britain continued to increase, and the Pedestrians Association stepped up its campaign in favor of speed restrictions. It was also an early voice against excessive private vehicle travel, publishing several papers that pointed out the dangers of relying too much on foreign oil. Nice history about a fantastic organization. I was particularly intrigued by the "play streets" idea. Do you know how successful that was and if implemented, for how long? "The Association supported Salford City Council in its design and adoption of the Play Street Scheme that closed local streets for two hours during the rush hour to allow children to play and meet safely after school. This idea has been constantly on the Association's agenda since the 1930's and is a primary Living Streets policy today." Thanks for the link Katie!